Tom is not only the best SAT tutor in the world, but also the most amazing tutor I've ever had! My SAT score increased by almost 500 points because of him. Now I feel really good about my college applications! Tom is way cool and knows his stuff. You changed the way I take multiple choice tests forever. You're the best. Tom made me work really hard but I'm glad that he did! I would never have studied so much on my own. I did much better because of it! Math is my worst subject and I scored the worst on it in the beginning. But when I started working with Tom he taught me some tricks and now it's not so bad. My score improved so much that I was able to get into one of my top pick schools. Thanks Tom. My ACT score was so low that I was seriously considering community college. With Tom's help I was able to increase my score so I have a chance to get into a better university. I couldn't have done it without his guidance. Congrats to my online students! Success stories from my recent students! Please sign up for the fall tests immediately! The average improvement after Tom’s 12 hour core program is 4 points. A few of his students have even improved by 11 points at the 12 hour mark! The national average improvement after a standard test prep program is only 2 points, and most programs run for over 30 hours! Over the last 19 years, Tom has researched countless tests and test prep methods. He kept everything that is effective, and eliminated everything that isn’t. His program is designed for maximum efficiency in the shortest amount of time (with the least amount of effort). That is why his students usually get double the results in less than half of the time. 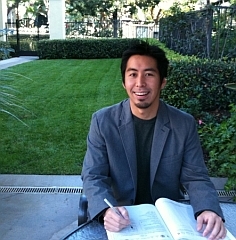 Formally one of the highest level SAT and ACT tutors for The Princeton Review, Tom has helped increase the scores of thousands of students in Southern California over the last 19 years. Tom combines his years of experience, dedication, and expertise to produce results in all types of situations. Tom has the ability to adjust the content and teaching style based on a student’s strengths and weaknesses. This leads to a truly unique, and highly effective, tutoring experience. Tom has taught students from all over Southern California and is now teaching in Orange County. He primarily teaches in Newport Beach, Irvine, Tustin, Huntington Beach, Corona Del Mar, Laguna Beach, Villa Park, Mission Viejo, Coto De Caza, San Juan Capistrano and other Orange County cities. He is also available for online tutoring.